phpBB • Give the option to users to list a thread in more than one subforums? Give the option to users to list a thread in more than one subforums? I have noticed that some of the starting threads could belong in more than one subforum, is it possible to add the option to list them in different subforums to increase visibility and replies? Re: Give the option to users to list a thread in more than one subforums? For clarity there are no threads with phpBB they are topics. It is not difficult to post a topic into more than one forum (I already have an extension that does this, but not in the way you are asking) - where the difficulty comes is in keeping the two fora in sync with posts, edits, deletes, moving posts etc. Thanks for the reply, just to be clear. English is not my native language, so I may was not clear. In the same on line community, I want to give the option to list the same topic in more than one forum. If an extension like this does not exist, are you aware of how difficult might be to make one (maybe someone can built in on top of yours?) if yes, how can I go about it? If yours do not keep in sync the topic, how does it work? Do you start a new topic giving the title and content and it gets posted in two or more subforums but then each one gets its own different replies? Do you think this is a good idea for an extension? Meaning do you see any negatives? There are times that a topic can possibly get posted in two forums, this could increase visibility and replies, and also boost collaboration between users that are used to stay only in one forum. For example in a mental health forum, when there are forums for drugs and psychological therapies, in some cases you may want to start a thread for this antidepressant combined with that cognitive therapy and get collaborative replies from users that seem to read only one forum. Maybe not the best example, but I hope you get what I am trying to say. I understand what it is that you want. The problem that I would have if it was my board is that I would not want a discussion taking place in two places about the same topic so unless you could keep the two topics in sync (which will be difficult) then It would be difficult to manage. Why not use shadow topics? You create the topic in one forum, and post a link to it under the other. May not be perfect, but will help you achieve your goals. I think this would indeed be a solution. Thanks, yes this is what I am looking for... To give the option to have the same topic posted in two subforums and keep them in sync. You are saying that this is difficult because how phpBB is been structured? I am new to this and I do not know how to possibly go about it, but any ideas where I can possibly find someone to get paid support? javiexin, pierredu, thanks for the replies, maybe I am wrong but I now believe that this is the best option for me long term. I'd like to 'bump' this request for reconsideration and hopefully encourage some development. And offer a slight modification from what was initially proposed at the beginning of this thread. Considering the two solutions put forth in this thread 1) posting a link back to the topic, a "shadow topic" and 2) moving the topic to a new sub-forum, leaving a link behind (another option), I think these ideas are not ideal for providing the best user experience. We have to keep in mind the variety of contexts that PHPBB is used and the experience level of some board users/noobies who may not be familiar PHPBB's hierarchical organization and functions. Given that there is the necessity to limit "noise" in the sub-forums resulting from an over abundance of topics, like adding links to topics as was proposed. In consideration of my audience, students, it does become important to streamline. I use PHPBB as a teaching tool so it becomes necessary to keep forums and sub-forums organized and pruned to minimize 'information overload' for students. Hence this extension request. Each class I teach is a forum...e.g. "Digital Media 101." Within that forum (DM101) there are 10 sub-forums that correspond to each week in the term...Week One, Week Two, Week Three, etc. Then within each sub-forum there are topic threads that are being categorized by 3DI's extension called "Topics Hierarchy." That allows me to separate topics by designating a topic as "Global Announcement', 'Announcement', 'Sticky', or 'General Discussion.' You'll notice from the attached graphic that I've also modified the PHPBB source code to clarify each topic category, e.g. 'Lectures, Lessons and Links' or 'Assignments.' (Sorry, but it's a configuration option that I need as well). 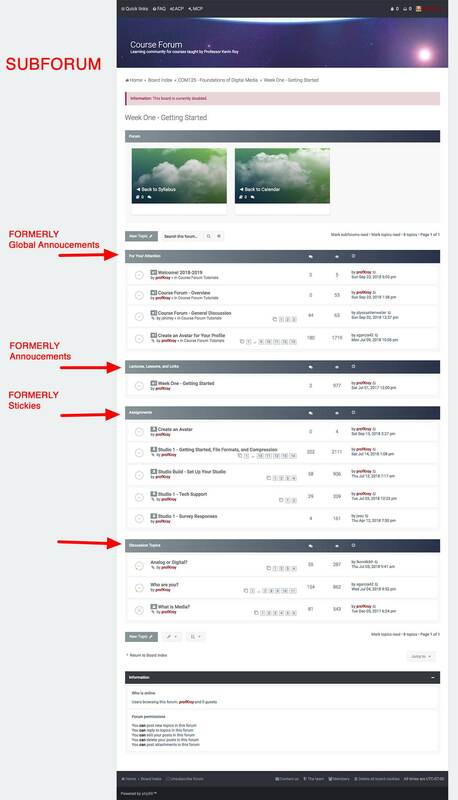 It would be useful to be able to categorize a topic and then have that topic span all the sub-forums, similar to the way in which a "Global Announcement' spans all of the forums. So for example, I want a topic called 'Tech Support' placed within a particular sub-forum's 'Announcements'. But I also want that topic to span and be synchronized across all of the sub-forums (weeks) within a particular forum. It'd be nice to select which sub-forums that would include the new topic as well. Such an extension would eliminate some confusion by introducing additional consistency of organization as my students move from week to week (sub-forum to sub-forum) of the course forum. Who's up for the challenge? PM me for details and further discussion.